Össur advocates research-supported validation of the efficiency and functionality of our products. Below you can find references to scientific publications in peer-reviewed journals on osteoarthritis of the knee, bracing and the effectiveness of the Unloader One. We have arranged the studies in chronological order and added a list of claims to each study for quick reference. Check back periodically as we will continue to update this page with new research as it is completed. Unloading knee braces can provide good short-term pain relief for some patients with unicompartmental osteoarthritis (UOA). Their cost is relatively small compared with surgical interventions. However, no previous studies have reported their use over a duration of 5 years or more. Up to 8 years of prospective data were collected from 63 patients who presented with UOA. After conservative management with analgesia and physiotherapy, patients were offered an unloading brace. EQ-5D (EuroQol five dimensions) questionnaires were collected at baseline and after wearing the brace. Cost and quality-adjusted life years (QALYs) were compared with a total knee replacement (TKR) with an 8-month waiting duration and 8 years of results. Patients experienced a mean increase in EQ-5D of 0.42 with an average duration of wear of 26.1 months resulting in an increase of 0.44 in QALYs with a mean cost of £625. The adoption of an unloader knee brace was found to be a short-term cost-effective treatment option with an 8-month incremental cost effectiveness ratio of £9599. Compared with no treatment, the unloader knee brace can be considered cost effective at 4 months or more. At 8 years follow-up, the unloader knee brace demonstrated QALYs gain of 0.43 and with an incremental cost-effectiveness ratio of -£6467 compared with TKR. Unloading knee braces are cost effective for the management of UOA. These findings strongly support the undertaking of further research into the long-term impact of unloading knee brace. The unloader knee brace has benefits to the National Health Service for capacity, budget, waiting list duration, frequency of surgery and reducing the required severity of surgical intervention. We evaluated whether a valgus knee brace and an insole with subtalar strapping could reduce pain and improve functional scores over 12 months in patients with medial knee osteoarthritis (OA). OA was confirmed by radiography in all patients, who were divided into three groups: exercise (n = 44), insole (n = 55), and brace (n = 19). Clinical knee functions and gait analyses were evaluated. After 12 months, the clinical results for all groups had improved compared to pretreatment findings. Although the knee varus moment decreased and the gait speed increased when the insole was worn initially, the effects of the insole decreased at 6 and 12 months. In contrast, the knee varus moment decreased and the gait speed increased when the brace was initially fitted. The effects of the brace were maintained during the 12 months. The insole was effective for patients with Kellgren-Lawrence Grades II and III, and the knee brace was effective for patients with Grades III and IV conditions. Furthermore, the knee brace was more effective when worn for more than 6 months, while the effects of the insoles were not continuous. Briggs KK, Matheny LM, Steadman JR. The purpose of this study was to determine if short form (SF)-12 physical component would increase with unloader brace use. Patient expectations and predictors of significant improvement were determined. Our hypothesis was that patients with unloader braces will have increases in general physical health (SF-12) and function (Western Ontario and McMaster Universities Arthritis Index [WOMAC]). Patients were enrolled in institutional review board-approved prospective cohort study. They completed a self-administered questionnaire (SF-12; WOMAC, Tegner activity scale, expectations) at enrollment, 3 weeks, 6 weeks, and 6 months. In this study, 39 patients, 23 males and 16 females (average age = 61 years [range 44 to 87]), were prescribed an unloader brace. Patients had significant improvement in quality of life (SF-12) (p < 0.05). There was significant improvement in pain, stiffness, and function (WOMAC) (p < 0.05). Patients who reported Tegner of 3 or greater at final follow-up had significantly higher SF-12 physical component (48 vs. 37; p = 0.023). Return to recreational sports was very important in 83% and somewhat important in 17%. Improving ability to walk was very important in 89%. Pain relief was very important in 69%, somewhat important in 17%. Of these, 39% expected most pain to be relieved and 57% expected all pain to be relieved. The most important expectations were to have confidence in knee (97% very important), avoid future knee degeneration (90% very important), and improve ability to maintain general health (93% very important). Patients demonstrated a significant decrease in pain and disability. Patients saw improvement in SF-12 physical component. Braces specifically designed to unload the degenerative compartment of the knee can be an effective treatment to decrease pain and maintain activity level to increase overall physical health. Osteoarthritis affects the whole body, thus biomechanical effects on other joints should be considered. Unloading knee braces could be effective for knee osteoarthritis, but their effects on the contralateral knee and bilateral hip joints remain unknown. This study investigated the effects of bracing on the kinematics and kinetics of involved and contralateral joints during gait. Nineteen patients with medial compartment knee osteoarthritis were analysed. Kinematics and kinetics of the knee and hip joints in frontal and sagittal planes were measured during walking without and with bracing on the more symptomatic knee. The ipsilateral hip in the braced condition showed a lower adduction angle by an average of 2.58° (range, 1.05°-4.16°) during 1%-49% of the stance phase, and a lower abduction moment at the second peak during the stance phase than the hip in the unbraced condition (P<0.05 and P<0.005, respectively). With bracing, the contralateral hip showed a more marked peak extension moment and lower abduction moment at the first peak (P<0.05), and the contralateral knee adduction angle increased by an average of 0.32° (range, 0.21°-0.45°) during 46%-55% of the stance phase (P<0.05), compared to no bracing. Unloading bracing modified the contralateral knee adduction angle pattern at a specific time point during gait. It also affected the frontal plane on the ipsilateral hip and the frontal and sagittal planes on the contralateral hip joint. Consideration should be provided to other joints when treating knee osteoarthritis. Evidence that knee braces used for the treatment of osteoarthritis mediate pain relief and improve function by unloading the joint (increasing the joint separation) remains inconclusive. Alternatively, valgus-producing braces may mediate pain relief by mechanically stabilizing the joint and reducing muscle cocontractions and joint compression. In this study, therefore, we sought to examine the degree to which so-called unloader braces control knee instability and influence muscle cocontractions during gait. Sixteen subjects with radiographic evidence of knee malalignment and medial compartment osteoarthritis were recruited and fitted with a custom Generation II Unloader brace. Gait analysis was performed without use of the brace and with the brace in neutral alignment and in 4 degrees of valgus alignment. A two-week washout period separated the brace conditions. Muscle cocontraction indices were derived for agonist and antagonist muscle pairings. Pain, instability, and functional status were obtained with use of self-reported questionnaires, and the results were compared. The scores for pain, function, and stability were worst when the knee was unsupported (the baseline and washout conditions). At baseline, nine of the sixteen patients reported knee instability and five of the nine complained that it affected their activities of daily living. Poor knee stability was found to be correlated with low ratings for the activities of daily living, quality of life, and global knee function and with increased pain and symptoms. Knee function and stability scored best with the brace in the neutral setting compared with the brace in the valgus setting. The cocontraction of the vastus lateralis-lateral hamstrings was significantly reduced from baseline in both the neutral (p = 0.014) and valgus conditions (p = 0.023), and the cocontraction of the vastus medialis-medial hamstrings was significantly reduced with the valgus setting (p = 0.068), as a result of bracing. Patients with greater varus alignment had greater decreases in vastus lateralis-lateral hamstring muscle cocontraction. When knees with medial compartment osteoarthritis are braced, neutral alignment performs as well as or better than valgus alignment in reducing pain, disability, muscle cocontraction, and knee adduction excursions. Pain relief may result from diminished muscle cocontractions rather than from so-called medial compartment unloading. Richards, J.D. ; Sanchez-Ballester, J.; Jones, R.K.; Darke, N.; Livingstone, B.N. Patients with medial compartment osteoarthritis of the knee may be treated nonoperatively with adjustable valgus bracing. Valgus bracing reduces load on the medial compartment through the application of an external valgus moment about the knee, resulting in pain relief. 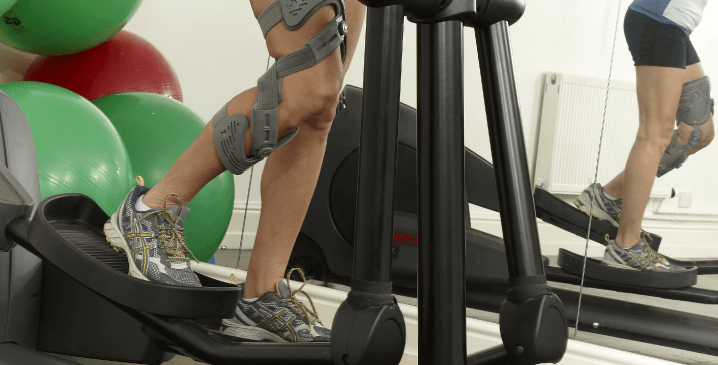 Eleven patients were tested using an instrumented brace and three-dimensional gait analysis. We measured the valgus moment applied by the adjustable valgus brace and determined the compressive load in the medial compartment. We also documented the effects of increased valgus alignment of the brace and increased strap tension on load sharing. Pain and activity levels were also recorded. Pain and activity level improved in all subjects with valgus bracing. During gait, valgus bracing reduced the net varus moment about the knee by an average of 13% (7.1 N.m) and the medial compartment load at the knee by an average of 11% (114 N) in the calibrated 4 degrees valgus brace setting. Increasing valgus alignment with the adjustable brace had a greater effect on the medial compartment load than did increasing strap tension. Adjustable valgus bracing was effective in reducing medial compartment load and subsequent pain while also improving knee function in a group of patients with osteoarthritis. The use of a valgus brace can effectively relieve the symptoms of unicompartmental osteoarthritis of the knee. This study provides an objective measurement of function by analysis of gait symmetry. This was measured in 30 patients on four separate occasions: immediately before and after initial fitting and then again at three months with the brace on and off. All patients reported immediate symptomatic improvement with less pain on walking. After fitting the brace, symmetry indices of stance and the swing phase of gait showed a consistent and immediate improvement at 0 and 3 months, respectively, of 3.92% (p = 0.030) and 3.40% (p = 0.025) in the stance phase and 11.78% (p = 0.020) and 9.58% (p = 0.005) in the swing phase. This was confirmed by a significant improvement at three months in the mean Hospital for Special Surgery (HSS) knee score from 69.9 to 82.0 (p < 0.001). Thus, wearing a valgus brace gives a significant and immediate improvement in the function of patients with unicompartmental osteoarthritis of the knee, as measured by analysis of gait symmetry. We assessed the clinical knee score and bone mineral density of the proximal tibia in an attempt to evaluate the efficacy of valgus knee bracing. The knee score improved after 3 months, and increases in bone mineral density were seen more in the lateral tibial condyle than in the medial. These results suggest that the brace acts by transferring the forces across the knee joint from the medial to the lateral side. The purpose of this study was to determine whether a brace designed to unload varus degenerative knees actually alters medial compartment loads by decreasing the adduction moment. Eleven patients who had arthrosis confined to the medial compartment were fitted with a valgus brace and tested before and after brace wear with pain and function scoring instruments and by automated gait analysis. The biomechanical data from these patients were compared with those from 11 healthy control subjects. Scores from an analog pain scale decreased 48% with brace wear, and function with activities of daily living increased 79%. Mean adduction moment without the brace measured 4.0 +/- 0.8% body weight times height versus 3.6 +/- 0.8% body weight times height when wearing the brace (10% decrease). The mean adduction moment for control subjects was 3.5 +/- 0.6% body weight times height. Thus, the mean adduction moment decreased from approximately one standard deviation from the normal mean to a value that is similar to the control value. Nine of 11 patients had a decrease in the adduction moment with the brace, five of 11 patients had a reduction higher than 10%, and decreases in this moment were as high as 32%. This study shows that pain, function, and biomechanical knee loading can be altered by a brace designed to unload the medial compartment of the knee. To investigate the clinical efficacy of the Generation II (G II) knee brace, a newly developed knee orthosis, on patients experiencing severe medial compartment osteoarthritis (OA) of the knee. A national medical and pharmaceutical hospital in Japan. Twenty primary OA subjects (excluding those with secondary OA), all older than 55 years of age and experiencing only knee joint problems, were selected according to their ability to walk more than 500 meters independent of support. These patients had arthritis in both knees and no less than one half of normal joint space remaining as revealed by roentgenogram studies. The more severely affected side was selected for bracing. For 12 months, each patient wore a G II knee brace on the affected knee on a daily basis, removing it only at night. To evaluate the effects of G II OA brace alone, additional use of new oral drugs or any other treatment was prohibited from 1 month before application of the G II OA brace and throughout the trial period. Clinical efficacy was evaluated using the Japan Orthopaedic Association's knee scoring system. X-ray evaluation was performed with patients standing on one leg. A dynamometer was used to evaluate isokinetic quadriceps muscle strength. The center of gravity was measured using an X-Y recording. Clinical evaluation was performed every 2 months thereafter. Final evaluation was at 12 months. Nineteen of the 20 patients answered that they experienced significant pain relief. Knee pain scores on walking increased from 18.0 to 21.5 and on ascending and descending stairs increased from 12.8 to 15.8. The femorotibial angle decreased in 12 of the patients, and the mean angle decreased from 185.1 degrees before application to 183.7 degrees with the brace on at the final observation period. In addition, isokinetic quadriceps muscle strength increased from an average of 36.8 Nm to 42.8 Nm for all patients. In 17 patients, quadriceps muscle strength increased, while it decreased in 2 and remained the same in 1. Finally, lateral movement of the center of gravity decreased compared with before G II application in all patients. G II bracing is a beneficial treatment for severe medial OA of the knee. Horlick Simon G. B.Sc. M.D. ; Loomer, Richard L. B.A., M.D. No change in tibiofemoral angles. 87% reported pain relief when the brace was in valgus, 67% with the brace in neutral and 56% with no brace. 93% of the patients in the medial hinge group reported continuous use of the brace post 20 months follow up.